One fateful day narrator William Guest falls asleep after returning from a Socialist League meeting and awakes to find himself years in the future. This world is a socialist pastoral paradise in which capitalism, private property, and industry have been overthrown and where people live in equality and contentment. The book addresses the balance of work and reward, expressing Morris' idea that mastery could be replaced by fellowship. 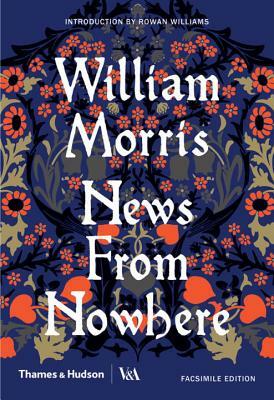 The first in a series of facsimile editions of collectible books from the National Art Library to be produced in partnership with the V&A, News from Nowhere is one of the most important English literary works on the theme of utopia. The novel, written by visionary English textile designer William Morris in 1890, is reproduced here for the first time in an accessible facsimile based on the original Kelmscott Press edition held in the collection of the V&A's National Art Library.